This past week our little family and burn community in Maine embarked on a great adventure to the UK. We packed up 11 young adults and two babies under 2 with a dream of seeing a city changed in a day. It all started last autumn after completing 60 hours of worship in Salem Massachusetts during a halloween festival, where we saw witches and warlocks get saved and deaf ears open on the streets. After commissioning 150 wild burners to bring love encounters in the darkest place in America, I dreamt of inhabited cities being possessed by God. I dreamt of the global epicenter of paganism and arts: Edinburgh Scotland. Without hesitation I contacted friends in England and I said “Why not Edinburgh?! If God touches Edinburgh, Edinburgh will touch the world.”. So with little recognition of the obstacles we invited the world to come burn with us in a place thats not our home, a place that we had never visited, but a place we loved. 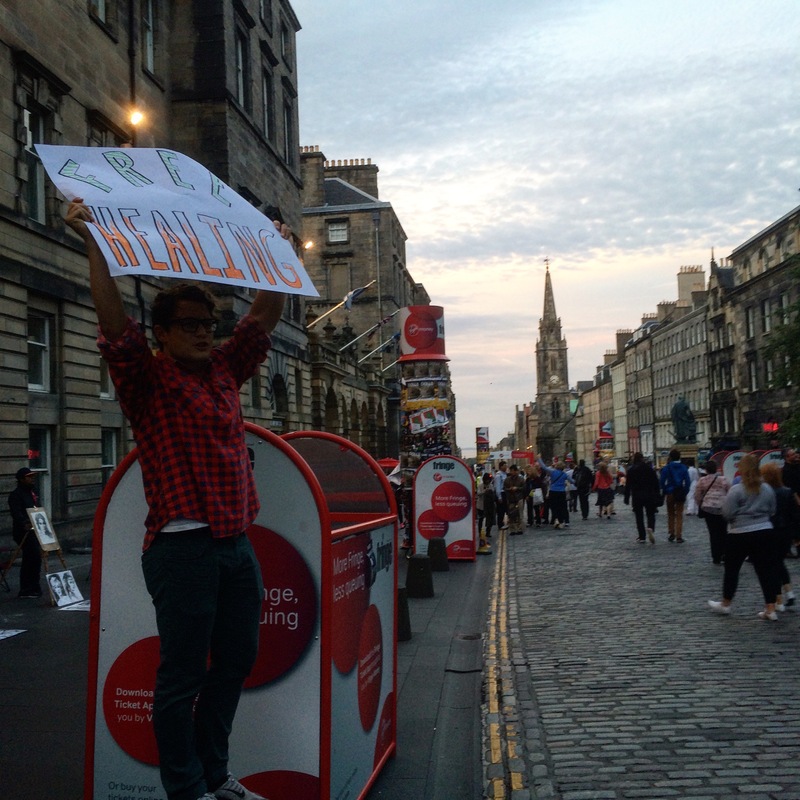 We called and the nations answered, we knocked on doors and they opened, and we gathered as many as 10 nations together for 60 hours in 150 year old church in heart of Scotland during the world’s largest art’s festival: The Edinburgh Fringe Festival. Under the canopy of worship and prayer we mobilized teams to engage the crowds of millions. Many of which had never seen a miracle, never led anyone to Jesus, or given a prophetic word within the confines of church walls, let alone the surroundings of paganism and creative anarchy. As we went we didn't know what to expect, we were completely out of our comfort zone, but we went with our feet clothed in the gospel of peace and our hearts full of love. One of the first groups we met were a group of half naked, cross dressing, male performers that made it very clear how much they hated Jesus. They had alter ego stage names they went by and were dressed in dramatic fashion. One of the young women on the team began conversing with them and shared encouraging prophetic words to one of the men, as she shared he began to become visibly shaken by the love and presence he was feeling. After she ministered to him she said “would the name Adam mean anything to you?” tears welling up in His eyes he responded “my name is Adam.”. That very moment this crossing dressing, angry, homosexual performer realized he was known by God. He was loved by God. In our three days of loving God in the prayer room and loving people on the streets we had encounter after encounter like this. One women chose to not take her life after she was loved by God on the streets, two other young ladies received site in their blind eyes, even the festival staff and entire performing groups were bringing their employees to our teams to receive ministry on the streets. As the final night was coming to an end and we danced in the rain through the puddles in this ancient city of Edinburgh we had become known as the carriers of Joy in a desolate place. I looked at these millions of people, the worlds greatest musicians, artists, poets, and performers. I heard their songs, I watched their shows, I laughed at their jokes. When I listened I heard a prayer in every song, I heard a cry in every joke, I could hear their longing - God answered their prayers during a 60 hour burn. God touched Edinburgh. In the collected songs of longing hearts across the nation we are breaking barrenness city to city, it’s bearing the fruit of salvation in our streets and neighborhoods. Here in the sound of day and night worship and prayer is an invitation to dream BIGGER… “Stretch out your tent pegs, increase your influence, make space for the harvest!”. As I dreamt for a city I had not known, the Lord reminded me “Jamie, you have so much more capacity for this then you realize.” and we all do. How many obstacles are keeping us from dreaming bigger dreams? If you’ve been singing it’s time to dream. Dream with me for cities and nations. You have all the capacity you need to see that dream come true. How many nations are untouched and cities unreached because we aren’t dreaming?